SAFE Systems electric deadman switches allow blasters to stop blasting immediately, when and if they need to do so. This improves worker safety and reduces the amount of abrasive material waste. Give your front line blasters the control they need, without sacrificing productivity. We provide replacement switch parts for our deadman switches so you can make changes on site, without delay. Green is our standard deadman switch color but a wide range of colors is available with orders of twenty-five (25) or more. 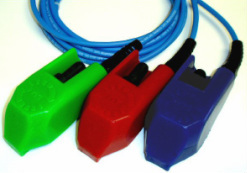 Blast lights are available with Enduroguard© cable by special order. 52' Enduroguard extension cables are available for easy hose, light and deadman switch assembly.